If you ask me, all signs point to a bikini so teeny. 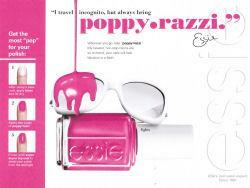 Wherever you go, take "poppy-razzi." My newest, non-stop neons are so on-trend, your nails will look fabulous in a flash. 1. After using a base coat, apply Blanc and let dry. 2. Apply two coats of Poppy-razzi lacquer. 3. 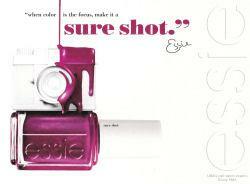 Finish with Super Duper Top Coat to shield your polish from the spotlight. 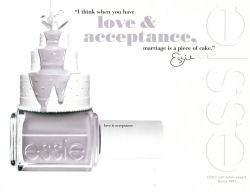 I think when you have love and acceptance, marriage is a piece of cake. When color is the focus, make it a sure shot. 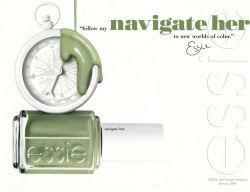 Follow my navigate her to new worlds of color. 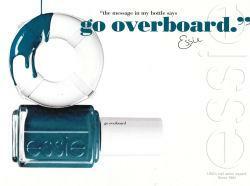 The message in my bottle says "go overboard." 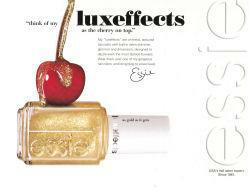 These textured top coats are designed to be worn over any essie nail color, and bring extra shimmer, glimmer and dazzle to any holiday.